Argus Home Security Solutions can supply and install automatic gates for your home or premises. 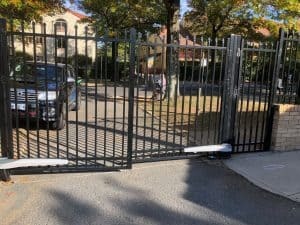 With close to 40 years of experience, we will make attractive and functional automatic gate to further secure your home. Gates can be made from Colorbond to match existing fences, or from Aluminium slats, powder coated to your choice of colour. Automatic gates can be sliding, or single or double hinged to make a swing gate. If you have an existing gate, in most cases we can fit the automation kit to it. We make gates to any height, standard fence heights or gates made to measure. Operating your automatic gates by solar operation is a cheaper option than connecting to mains. The solar panel will charge a battery pack that operates the gates. The solar kit sits subtly on the side of the gate, not detracting from the panels or your home facade. A soft open/close feature will add a touch of elegance. Our gates can be connected to mains power with a 240V operation. All our gates can be operated with a remote control, or a digital code pad fixed to the gate. Either battery or Solar powered, gate openers can easily be fitted to your existing gates. All our gates come with an emergency override feature and safety beams. There is minimum maintenance required, our gates are made to last for years. With our powder coated finish or colorbond panels, they wont rust and will not rot like timber.